With the TT Login dialog box, you can easily log in to multiple exchanges at once. 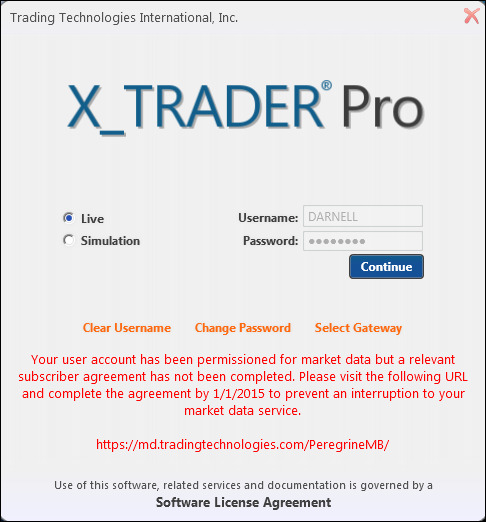 Your individual MemberGroupTrader IDs are mapped to one Username in TT User Setup. Simply type your Username and Password in the TT Login dialog box and click the Log In button. Double-click the icon from your desktop. The TT Login dialog box appears. Click to select Live or Simulation. Warning! 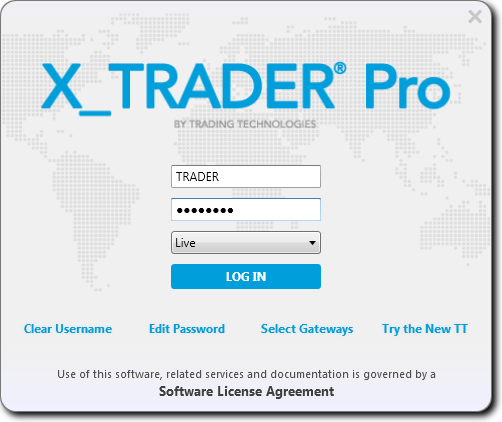 By selecting Live you are logging into the production trading environment. If you choose to continue, click Log In. The gateway login section displays and informs you if any selected gateways (i.e. flavors or brokers) are unavailable. Modify these as needed, see Manage Login Gateways for more information. In X_TRADER ASP only, X_TRADER® and X_RISK® users that subscribe to CME market data will be presented with a link to the CME Market Data Subscriber Agreement when they log in to those applications. All users must sign this agreement by January 1, 2015 to continue subscribing to CME Market Data. This requirement applies to users in production and SIM environments. Click the link in the warning message displayed on the Login screen. After you follow the link and accept, TT User Setup is notified and you will be flagged in the database as having accepted. In TT User Setup, this appears as a checked read-only checkbox in the Subscriber Agreement Signed column in the user Product Group Permissions window and the market data accordion in the Web Client.